The access method enables us to specify the sort order for values when an index is created (only applicable to «btree» so far). Support of the unique constraint and primary key (only applicable to «btree»). An index can be built on several columns. Support of the exclusion constraint EXCLUDE. A possibility to reorder rows according to the index (clustering with the same-name command CLUSTER). Support of index scan. Although this property may seem odd, not all indexes can return TIDs one by one — some return results all at once and support only bitmap scan. The result can be returned in the reverse order of the one specified when building the index. asc, desc, nulls_first, nulls_last, orderable. These properties are related to ordering the values (we'll discuss them when we reach a description of «btree» indexes). The result can be returned in the sort order determined by the operation (only applicable to GiST and RUM indexes so far). A possibility to use the index without accessing the table, that is, support of index-only scans. Support of search for several values with the expression «indexed-field IN (list_of_constants)», which is the same as «indexed-field = ANY(array_of_constants)». A possibility to search by IS NULL and IS NOT NULL conditions. We've already discussed some of the properties in detail. Some properties are specific to certain access methods. We will discuss such properties when considering these specific methods. In addition to properties of an access method exposed by the described interface, information is needed to know which data types and which operators the access method accepts. To this end, PostgreSQL introduces operator class and operator family concepts. An operator class contains a minimal set of operators (and maybe, auxiliary functions) for an index to manipulate a certain data type. An operator family can also include additional operators to compare values of different types. Grouping into families enables the planner to use an index for predicates with values of different types. A family can also contain other auxiliary functions. In most cases, we do not need to know anything about operator families and classes. Usually we just create an index, using a certain operator class by default. 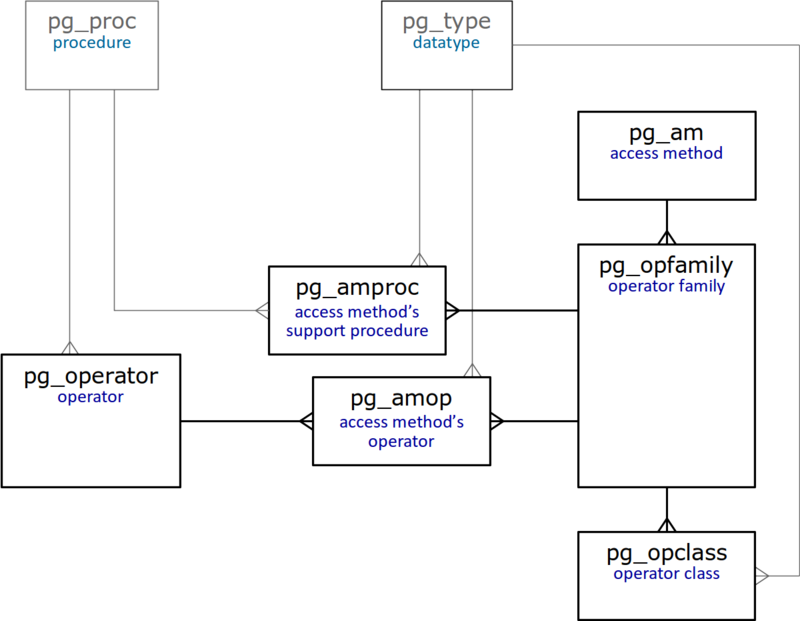 In conclusion of this article, we provide a simplified diagram of tables in the system catalog that are directly related to operator classes and families. It goes without saying that all these tables are described in detail. The system catalog enables us to find answers to a number of questions without looking into the documentation. For example, which data types can a certain access method manipulate? Which operators does an operator class contain (and therefore, index access can be used for a condition that includes such an operator)?